Carte du Bassin de la Mer Mediterranee. This is a beautiful large format 1860 elephant folio map of the Mediterranean Sea and vicinity by A. H. Dufour. Centered on the Mediterranean Sea, it covers from the English Channel south to the Sahara Desert and from the Atlantic Ocean to Syria in the east. It notes important cities throughout and depicts the boundaries of most of the European counties and territories. Rivers, islands, mountains and a host of other topographical features are noted. This map was prepared by Auguste-Henri Dufour and engraved by Charles Dyonette for publication plate no. 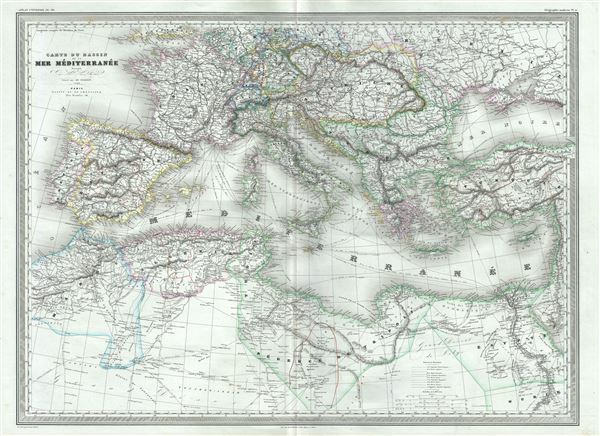 30 in Armand Le Chevalier's 1860 edition of Atlas Universel, Physique, Historique et Politique de Geographie Ancienne et Moderne.